Officially, Virginia’s state fish is the beloved brook trout. Unofficially? Anyone familiar with the politics of fishing in the Old Dominion would be forgiven for assuming that the humble menhaden takes home that prize. Menhaden are surprisingly important in Virginia and all along the East Coast because “as the menhaden go, so goes everything else”: Stripers, bluefish, red drum, Spanish mackerel, tuna, flounder, cobia, and tarpon all enjoy menhaden, as do crabs, lobsters, whales, and water birds like pelicans and ospreys. But one predator has its eye more closely fixed on menhaden than all the rest: the Virginia state legislature. Menhaden migrate from Maine to Florida and at times teem in vast schools along the Virginia coastline. Though humans don’t eat menhaden, we certainly harvest them in large numbers—and have since Virginia was a young colony. At one time menhaden harvesting was so lucrative that commercial anglers and processing plants were popping up all along the coast. In its heyday, the menhaden industry boasted as many as 150 plants stretching from North Carolina to Maine. Today, however, the industry is a shadow of its former size and only one corporate player remains: Houston-based Omega Protein, the largest harvester of menhaden in North America. Like so many others in tiny Reedville in Virginia’s Northern Neck along the western shore of the Chesapeake Bay, Monty Deihl is a fourth-generation menhaden fisherman. Deihl grew up near Reedville and has returned to live there following a distinguished career in the Air Force. Today he manages Omega Protein’s Reedville processing plant, the lifeblood of the town, employing about 300 people and pumping $80 million into the local economy per year. Critics—including conservationists and recreational anglers—believe that because of its deep roots in the state, Omega Protein has too much influence over Virginia’s marine resources policy. This is why, they argue, every other state on the East Coast has banned Omega Protein from fishing in state water—except Virginia. They also note that whereas the Virginia Marine Resources Commission (VMRC) has jurisdiction over all other saltwater fish in the state, it has no jurisdiction whatsoever over menhaden. Who does? That responsibility lies solely with the Virginia General Assembly. Created in 1875 and originally called the Virginia Board of Fisheries, the VMRC was charged with repopulating the rivers and streams that had been ravaged by Union and Confederate armies during the Civil War. By 1884 the agency was managing oysters as well; by 1990 management of nearly all of Virginia’s marine resources had been turned over to the VMRC. Critics of the Virginia legislature’s management of menhaden have just one question: If the VMRC is competent to handle nearly everything that swims or crawls in the Chesapeake Bay, why aren’t its commissioners competent to manage one lowly species of baitfish? In answering their own question, critics contend that the VMRC would manage menhaden according to the research—and that would be bad for business. Managing marine resources is particularly challenging because they are, quite literally, a moving target: Fish like menhaden migrate hundreds of miles in a single season, crossing various state lines and multiple jurisdictions. Created in 1942, the Atlantic States Marine Fisheries Commission (ASMFC), a consortium of 15 states from Maine to Florida, manages the fisheries for part of the Chesapeake Bay and for waters 3 to 200 miles off the East Coast. (Individual states manage their own resources from their shoreline to the three-mile limit that marks ASMFC jurisdiction.) 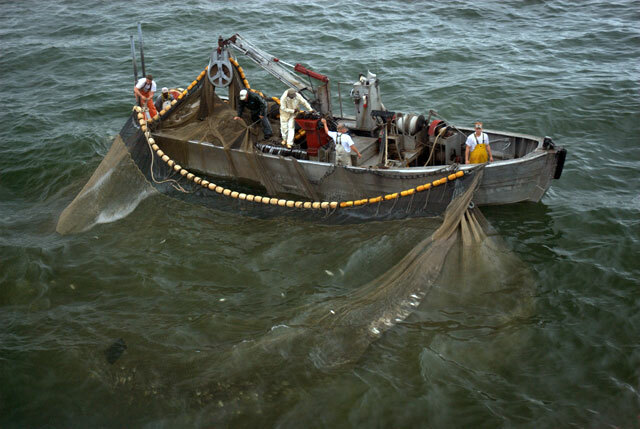 Among its many other responsibilities, the ASMFC sets and restricts the harvest levels of about two dozen species of fish along with crabs, shad, lobster and the lowly menhaden. In December 2012, the ASMFC voted for the first time in history to set a limit that cuts harvests by 20 percent of the 2009-2011 average landings. Previously there was no limit on the number of menhaden Omega Protein could harvest outside the three-mile limit. In the Chesapeake Bay, the Virginia legislature applied a limit in 2007, but this limit was never reached. So the ASMFC’s dramatic, first-ever coastwide limit finds conservationists jumping for joy, commercial anglers wringing their hands, and the Virginia legislature scrambling to comply with the new landing limits. Conservationists also cite studies to bolster their arguments—and their studies, by contrast, suggest that the situation is grave for menhaden and the creatures that love them. 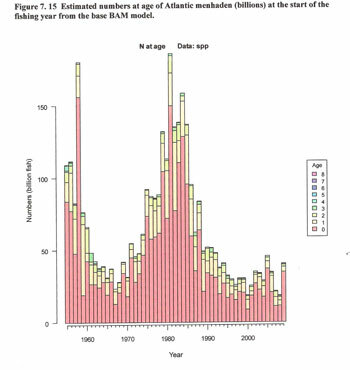 In fact, they argue that the ASMFC’s new menhaden harvest cap is too modest. One study indicates that nearly half of all Bay stripers suffer from ugly lesions thought to be brought on by malnutrition; conservationists believe that the lack of forage fish like menhaden is at the root of the problem. 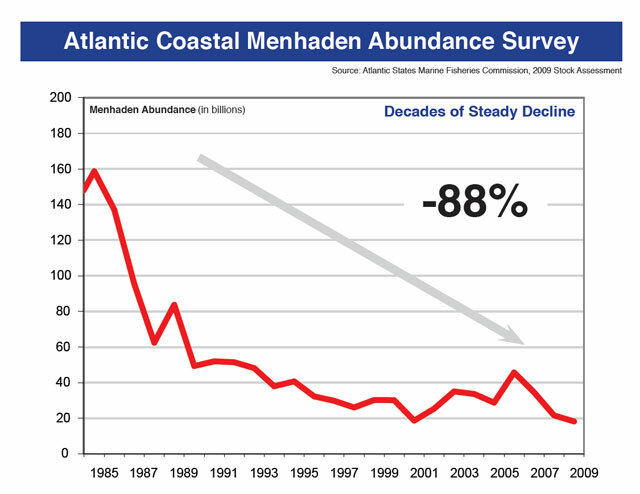 They also point to recent stock models indicating that menhaden stocks are at an all-time low of just 8 percent of an unfished stock. “After unprecedented public comment in which more than 100,000 Americans called for reducing the amount of menhaden killed by industrial fishing corporations each year, managers at the ASMFC made a reasoned decision,” says Peter Baker, Director of Northeast Fisheries Program for Pew Environmental Group. “Leaving more menhaden in the water is expected to have positive benefits for recreational fishermen as well as many species of marine wildlife which might otherwise go hungry.” A recent Richmond Times-Dispatch op-ed, written by Bryan Watts, Director of William and Mary’s Center for Conservation Biology, asserts that low osprey birthrates are a direct result of too few menhaden. All opinions and studies aside, the harvesting cuts will be implemented. If Virginia fails to comply with the ASMFC decision, officials at the US Commerce Department may have the authority to shut down the entire menhaden fishery. State Delegate Edward Scott (R) has introduced House Bill 2245, designed to bring Virginia into compliance with the ASMFC: Though the state legislature would continue to oversee menhaden management, the VMRC would be charged with implementing compliance with ASMFC directives. Stakeholders expect a vote on the bill in the Virginia legislature shortly.